If you saw my recent post, you’ll of seen that fitness was a part of my goals for this year as i’d been quite consistent with my fitness in the latter of 2017 and I wanted to continue on my fitness journey into this year. Fitness is a topic I have previously featured and spoken about on my blog, but like most people I fell of the wagon and i’ve never been that consistent with it up until now, but it is a topic I want to bring back to my blog and share more about, to hopefully motivate and inspire you somewhat. So i’m going to strip it back at start from the beginning, and discuss my fitness journey this far, and how i’ve gotten to where I am today. I’ve always had a love hate relationship when it comes to sports and fitness in general. PE wasn’t my favourite of subjects at school and I hated that most of the outdoor sports were played in the winter, I mean cross country in hale is something i’ll never put myself through again but I did love a good game of rounders in the summer. After leaving school I didn’t really think that much about fitness and it’s safe to say turning 18 and regularly drinking made me pile on a few pounds, and over the next sort of four years I dabbled here and there with the gym. I’ve been signed up to a good four gyms in the last five years, and have tried just about every class going. Some months i’d be dedicated and other months I wouldn’t go once but back when we booked to go to Ibiza I knew I needed to sort myself out for that holiday and in some respects I did, but it’s safe to say things do not happen overnight, and I quickly learnt that cardio isn’t the be all and end all to losing weight/toning up. As soon as that holiday was over with, I lost all motivation for the gym as I had nothing to work towards as such, and here I was back to being motivated some months and other months hardly going. When 2017 rolled around, I knew that I wanted to get back into the gym because it has always been a good stress release for me and I really started to notice how down I was feeling, so I decided to move gyms. Mainly because my gym was closing and a newer 24 hour gym had opened up just around the corner, so it made sense. To start off with I was very intimidated, as you get comfortable to your surroundings but going into a new gym was very daunting for me and it took me a few months to muster up the courage to go in the weights room, even if there was some good eye candy in there. After a few months of getting comfortable and getting myself into a routine I started to feel more inspired and I found following fitness instagrammers (such as GraceFitUK, Em Moore and Claudia Fit) to be so much more motivating, and it meant that I could follow along with their routines and kind of look like I knew what I was doing whilst in the gym (lol). It also got me into the idea of getting myself some PT sessions because I really wanted to learn more about the gym equipment and I wanted to build my confidence even more. So I enquired at my gym, as they have a fair few PT’s and i’ve now been having PT sessions with the lovely Georgia from Georgia Radley Fitness for around 3 months now, who literally pushes me to the point of where I physically can’t do another rep. I’d definitely say that getting a PT was the best thing I ever did and I can now lift weights that I never thought little me would be physically able to and i’ve noticed such a change in my figure, which has really helped boost my confidence! So that is an over view of my fitness journey this far and i’m really excited to see where this year takes me in terms of fitness. I also really want to continue sharing content around fitness on my blog, because it is quite a big part of my life now and I know it sounds a bit sad, but I look forward to the Sunday night food prep, and picking out what gym gear i’m going to wear during my next session (lol). So keep an eye out if you’re interested in fitness content, but also please let me know if there is any content you want to see specifically. 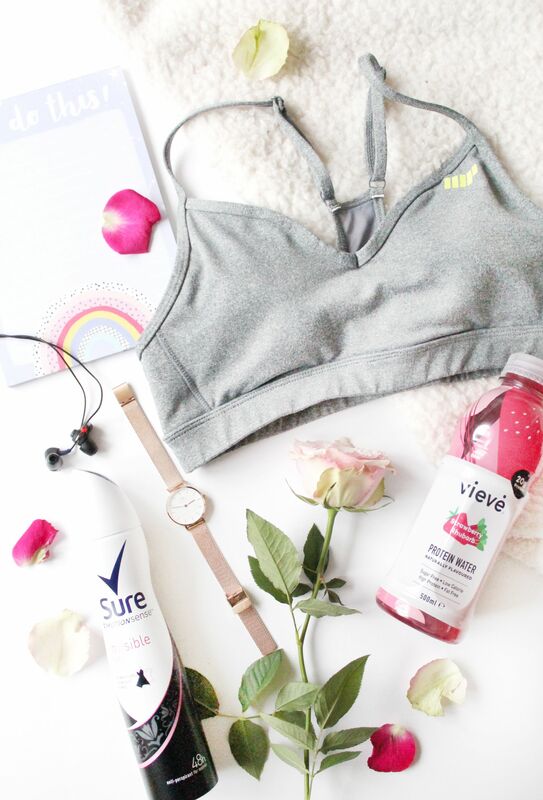 Whether it’s my favourite fitness clothing brands or my favourite healthy snacks, you name it! Does any of you have any fitness related goals this year?